Good films drop an audience into a crevice of the world and show us how they reflect something larger that exists in our own lives. 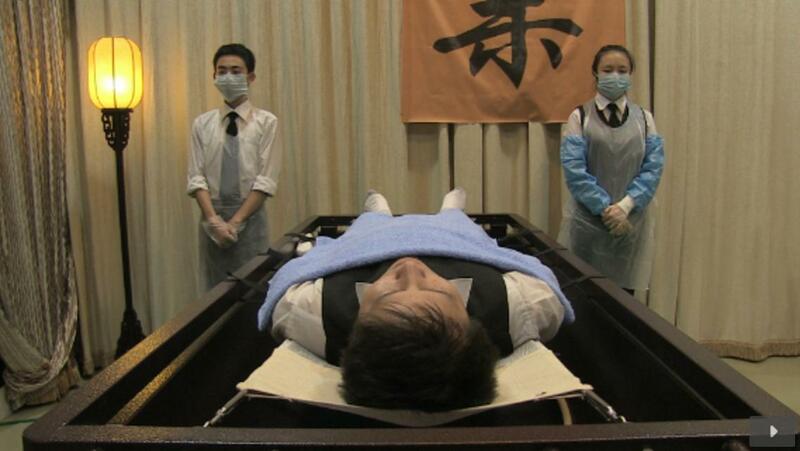 First time director Carol Salter has done just that with Almost Heaven, a documentary following Ying Ling, a seventeen-year-old who’s training to become a mortician in China. This is a film that’s filled with dead bodies and mention of ghosts, yet it’s calm, gentle, never forced – comforting even; like a spa treatment for the soul. This observant and relaxed approach mirrors Ling’s own professionalism as she learns to prepare the deceased for their final moments in this world. Salter documents Ying Ling and her relationship with her family and a co-worker. Almost Heaven finds a machine-like order in the morbid corridors of the crematorium and how Ling balances her life outside of it. Ling’s everyday work and social life feels “ordinary” and the calmness of how Salter presents it to us makes the end of life seem tranquil. Ling appears as an average person but step back and her job sounds like an angel preparing a spirit to leave this realm. The film never pushes such an allegory -- besides maybe its title -- but that I thought of it while watching is telling. Ling’s life emerges to be like that of any of young adult in any place in the world. People come into your life, then leave. You miss what’s gone. The comfort of home has faded. All you want to do is find your place, a place that makes you belong. But where Almost Heaven becomes a genuinely interesting film is in how Ying’s change in her life is not dissimilar from her new job, which exists in a limbo between death and whatever step is beyond this transition. Her moment in life is seen in physical spaces as she wanders through the city, in cemeteries, and at the maze-like corridors of work. The spaces she wanders mirror her own mental state and time in her life. Salter has made a film about transitions between places, relationships, homes, and career. This documentation of the everyday world works for relatability, but the focus on just one subject limits the film's scope and thematic depth. At just over an hour it feels like its subject matter is untapped in notable places. While they're in the peripherals, the film’s not concerned with the afterlife and the lives of the deceased. They act as minor motifs that build upon Ying’s story, but aren’t developed themes. Salter’s well-crafted first feature will linger in your mind and will make it hard to forget her name, or her subject. It’s a film that’s literally filled with morbid subject matter but is quiet, never preachy, soothing, and observes instead of tells. Ling’s story is one like everyone’s, but Salter’s observance illuminates our own by documenting how the everyday of one person on the other side of the world can brightly shine a light on connections that exist in our lives and what physically surrounds us. There are lots of films out right now that are worth seeing, but make it a priority to see this one. Besides showing us a unique world, this may very well be the best film I’ve ever seen about what millennial’s lives are like when they enter the work force. Almost Heaven uses the ordinary to make us see the details and careful construction of how an angel (or just a girl) prepares the dead for the beyond (or just a grave). Almost heaven indeed.